Sergio Leone’s original vision for his masterful 1984 crime drama Once Upon a Time in America will makes its U.S. debut with the release of the Extended Director’s Cut Collector’s Edition. 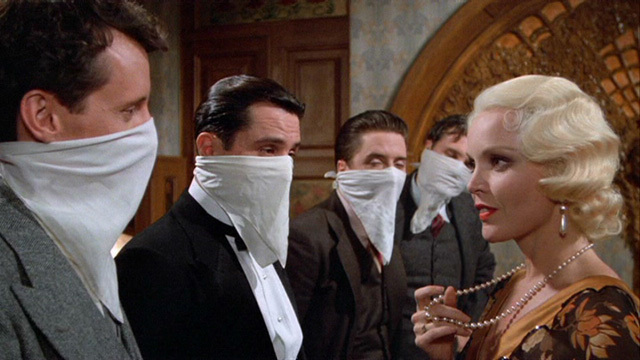 Tuesday Weld meets the boy in Sergio Leone's Once Upon a Time in America. The 251-minute cut of Once Upon a Time… was a restoration funded by The Film Foundation, the film preservation organization founded by Martin Scorsese (Shutter Island), and its partner Gucci. The Extended Director’s Cut, with 22-minutes of restored footage, made its debut at the 2012 Cannes Film Festival and was screened at other festivals in Europe. The restored footage has been returned to the film three decades after its theatrical release, deepening the characters and enlarging the work of its astonishing cast: Stone‘s Robert De Niro and Straw Dogs‘ James Woods as lifelong pals and crime kingpins, Tuesday Weld (Thief), Joe Pesci (Raging Bull), Jennifer Connelly (The Rocketeer), Elizabeth McGovern (TV’s Downton Abbey), Treat Williams (Prince of the City) and Louise Fletcher (One Flew Over The Cuckoo’s Nest). The latter three are showcased in recovered scenes. The movie has a famously checkered history, having been chopped from its original 229-minute director’s cut to a generally detested 139 minutes for its U.S. theatrical release back in ’84. It was first offered on Blu-ray in its original 229-minute for back in 2011. Prior to the Blu-ray release, Once Upon a Time in America will have its U.S. premiere at the 2014 New York Film Festival this September. The Collector’s Edition contains a new 32-page book with rare photos and insightful notes that chronicle the movie’s production history, along with a letter written by Martin Scorsese wherein he offers insight into the film’s missing sections that were found and re-inserted into the picture under the supervision of Leone’s family and surviving collaborators. Alongside the Collector’s Edition, the Director’s Cut will be offered in a single-disc Blu-ray edition and a two-disc DVD edition.